You are not logged in. [Log In] BackcountryForum.com » Forums » OTHER BACKCOUNTRY ACTIVITIES » Backcountry FISHING » Bugs, Blisters, and Broken Rods. 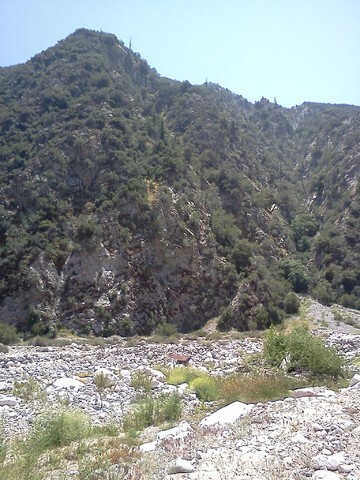 3 day SBNF trip..
#166095 - 05/22/12 02:27 PM Bugs, Blisters, and Broken Rods. 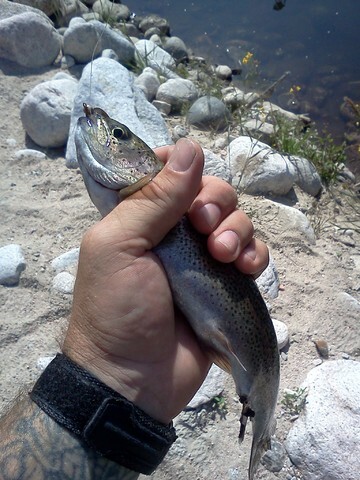 3 day SBNF trip..
After talking about it for weeks, my buddy Tacklejunkie and I pulled the trigger and treked out on a three day journey in search of wild trout, with a side of peace and quiet. 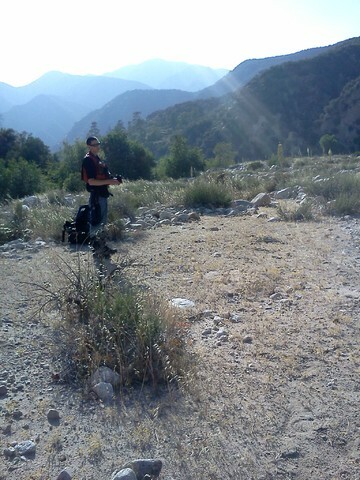 We decided that I would bring ultralight gear and he would bring a fly rod. 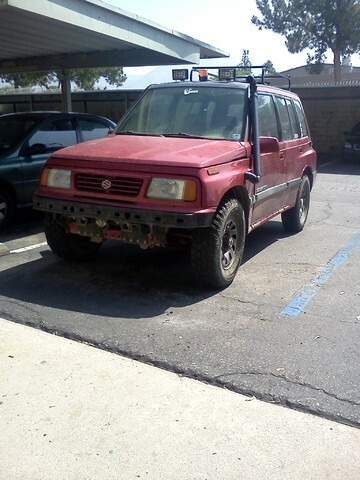 Friday morning we met at my place and loaded up our packs in the Suzuki. We then headed up into the backcountry. After ten miles of running rough dirt trails, we arrived at the one thing we didn't want to see...A locked gate! This added an additional three miles+ to our journey, however, it wasn't going to come between us and our goal. 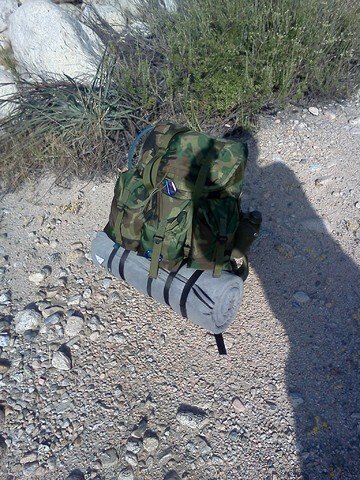 We geared up and started the long descent into the canyon. We got down to the river and saw that the flows were perfect. 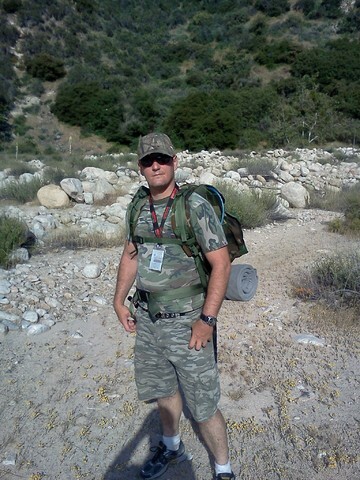 So we began the five mile journey to our base camp (the last mile of which would be off trail, and require hopping over boulder fields with 40 pound packs!). 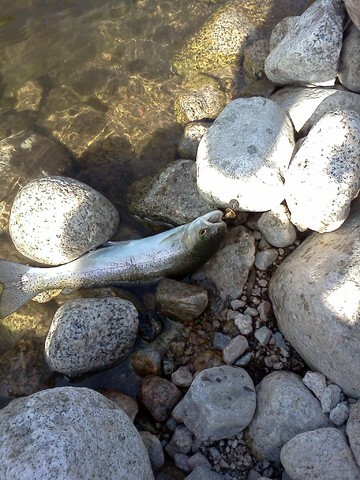 We stopped at the trail's end and fished a large pool for a few minutes, to catch dinner. A few casts of my micro jerkbait and Panther Martin and mission accomplished. Four nice trout ready for the pan. We now began the hellish task of navigating a mile-long field of large boulders, many of which were not quite as sturdy as they appeared. We both did a bit of rock surfing, albiet with 40 pound packs on, but luckily nobody fell or was crushed in a mini rockslide. At about 1700 hours we arrived at the area we would call home for the next three days. 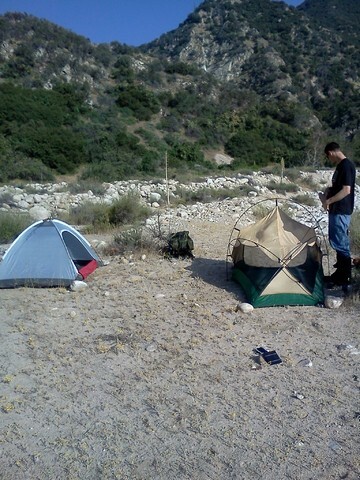 We set up our base camp, fetched water for cooking, and relaxed for awhile. 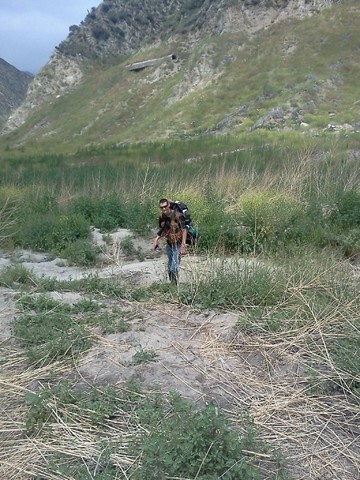 While unpacking, TJ realized he had dropped something along the trail and headed back to find it. 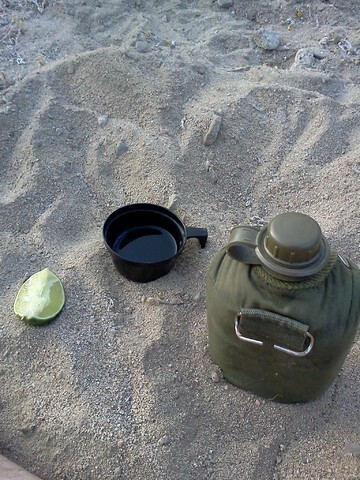 I cracked open my quart canteen of anejo tequilla, cut up a lime, and commenced operation chillout. As I layed there in the sand, an epic display of nature's beauty played out in front of my eyes. Hundreds of swallows converged on the area, and began dipping and diving, chasing insects around in the sky. Many were zooming right over my head, picking off mosquitos that had plans for my blood. It was quite a sight to see. As the sun dropped, the swallows were slowly replaced with bats. I sat in the sand, put on some tunes, and meditated for awhile before TJ arrived back at camp, just beating nightfall. He then commenced to treating some nasty blisters he got, thanks to the evil Dr. Sholl and his nefarious orthotic inserts. We fryed up some fish and ramen noodles, talked for awhile, then retired for the night. Next morning I woke up for the tenth and final time that night, due to my tent being pitched on ground that was about as flat as a railroad track. I stretched out, put on a pot of oatmeal with dried fruit, and geared up for the journey into untouched waters. 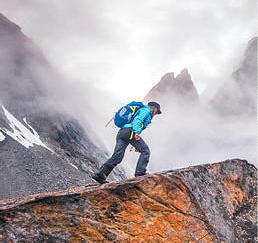 TJ advised that he would be restricted to the areas near camp, due to his blisters. 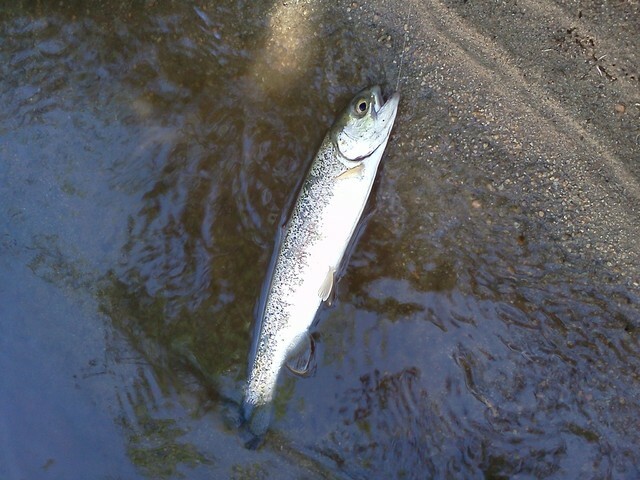 He headed down to a large pool nearby, and I began fishing my way upstream. 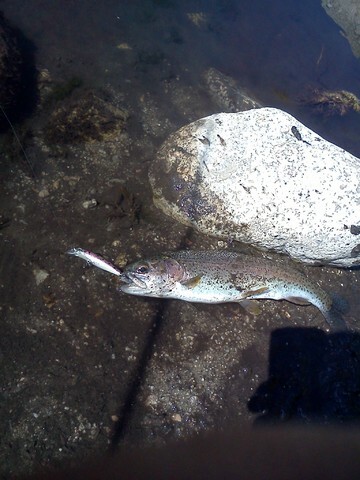 Every piece of fishy looking water held several hungry rainbows, many 12-15" long, who were very cooperative in eating my spinners. I fished upstream until I hit a major choke point that was so thick it was impassable for anybody who didn't want to take a swim. 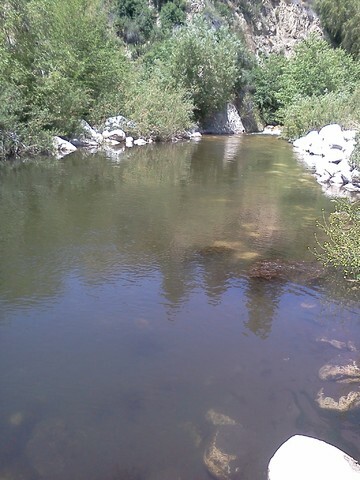 Considering that the whole area was so fishy, I headed back downstream, stopping at TJ's pool to say what's up. I found him sitting on a rock with his bear spray holsters wrapped over his feet like makeshift sandals. I chilled there for a minute, then headed downstream to fish the stretch of water we had skipped over while rock hopping. This area was amazing. 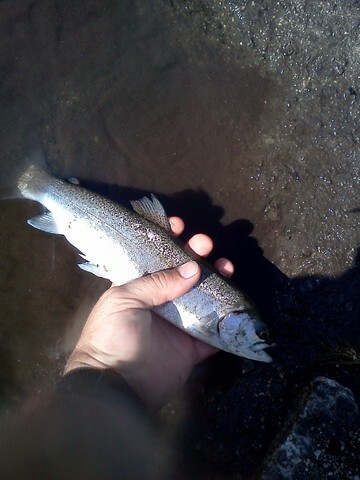 I was catching four nice fish per pool, with lots of others holding in runs and riffles. 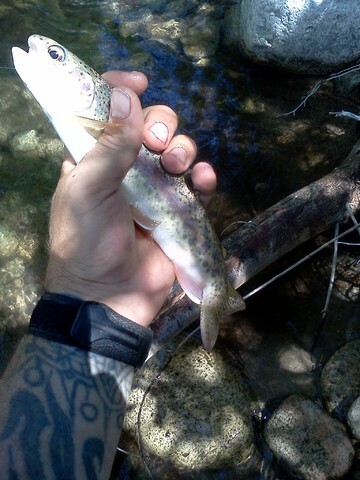 I worked my way all the way back to the trail's end, and then decided to head back to base camp after a good 50+ fish. 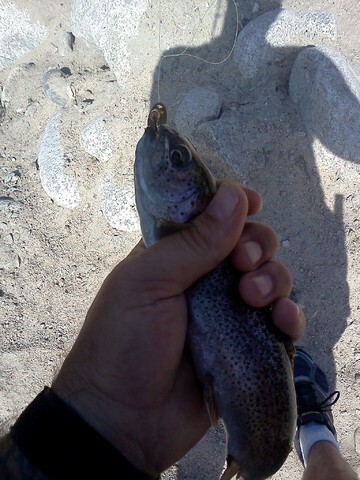 I tossed three nice 14" fish in my daypack of course. A man's gotta eat, ya know? Here are a couple of the fish from that area. The biggest probably went all of 16-17". I got back to the pool TJ was at and strung the fish in the water to keep 'em cold for dinner. 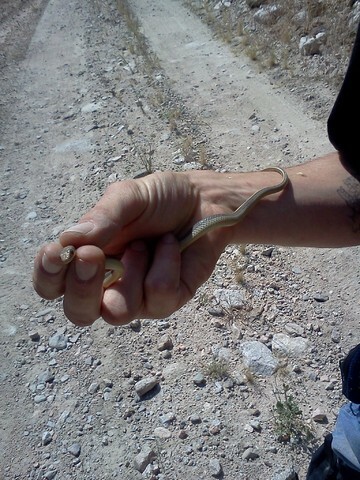 We chilled in the shade there for awhile, caught another snake, and generally killed time. At about mid afternoon, we headed up to camp and treated some water, due to TJ's water filter taking the proverbial dump, and dried our shoes. It was hot, but there was a nice breeze blowing. Perfect beach weather. First order of business was to move my tent to a more comfortable piece of real estate. I then stripped down to my shorts and sprayed down with sunscreen, TJ followed suit. I actually got a decent tan, lol. We fiddled with the water filter and finally TJ was able to use a lighter to melt the broken pieces back together. We then did battle with the flies for the next couple of hours. I think they won. Once the sun went down and it cooled off, I proceeded with operation "Get F'ing Hammered," and strategically put down 20 ounces of tequilla in 10 minutes, using up an entire lime in the process. I stumbled around camp barefooted for awhile, listening to music. 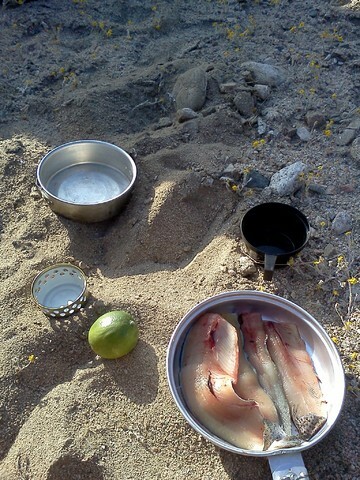 We then retrieved our fish and cooked up some dinner. Ramen with hot sauce for me, and rice for TJ, which was supposed to cook in the bag, but turned out to melt together with the bag instead. 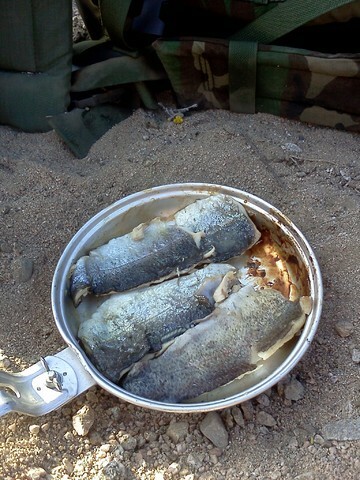 I broke out my ultralight pans and we fried up the trout fillets. We stayed up 'till about 2300, then passed out. I slept much better with flat ground and half a bottle of tequilla in me. Sunday morning we awoke and began to break camp. 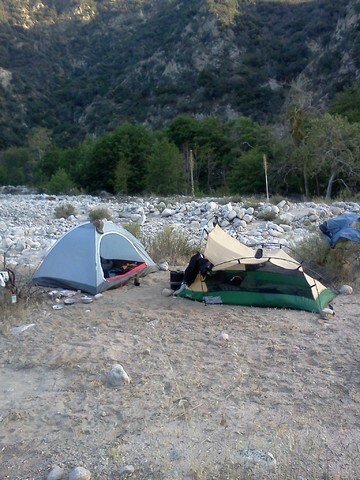 I cleaned up the campsite while TJ fetched water for the trip out. Once we ate and had finished packing our packs, we embarked on the toughest part of every backpacking trip...The hike back out. Along the way we bumped into some fisherman who advised that the gate was now open. Damn it! A lot of good that does us now. TJ's blisters were not doing so well, and his calfs were locking up. After a mile or so it was decided that I would hike ahead and get the truck. Then drive back to the second gate to pick him up, saving him a good three miles of agony. We talked for a few minutes, and he voiced his displeasure at that gate being locked in the first place. I told him to be safe, then headed back down, bombing the trail at 40 mph, lol. It felt good to sit in a real chair. About ten minutes later I arrived at the second gate, and TJ hopped in (more like crawled in, lol!). He said he had never been happier to see that truck. 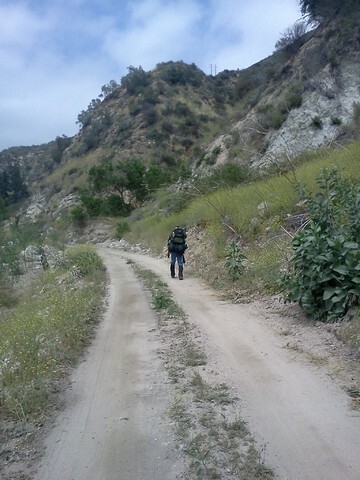 We then drove the 12 miles of trail back to civilization. TJ took a cool video of me bombing the trail out. After 45 minutes of trails, I finally hit concrete, and dropped him off at the ranger station where his girlfriend would be picking him up. Part of me was relieved to be back, another was sad. But that is the way of these things. It's a love hate relationship we all have with mother nature. Or maybe it is just tough love. Either way, like any abusive relationship, I always end up being drawn back. Until next time, keep your rods in the air and your feet on the trail. Edit: For some reason some of my images won't embed? TO know others is wisdom. To know one's self is enlightenment. Looks like ya'll had fun. I know my last trip the hubby ended up with blisters - donno your pal but hubby is getting new better fitting boots! He climbed Mt. Whitney in those boots without a single blister. His downfall was putting in some Dr. Scholl's orthotic heel inserts. It forced his feet forward and blistered the balls of his feet. I didn't have any issues with my Saucony Grid Ridge TR trail runners, he he. Best $40 I ever spent on hiking shoes. I love it, the way thalf those fish are just jumping into your hands! . That are is pretty cool. Our traditional choice for the area was Gusano Rojo. Later, a Mexican friend told me that that stuff is for the gringos only . Thanks for posting. Great weather and great fishin'. Awesome. That's a lot of rainbows you got there. Good fishing. Thanks for the write up.